Blighted neighborhoods are genuinely a trap, but they’re only a trap for the unwary. 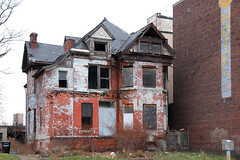 Blight – in Detroit, it’s essentially defined as “a property that hasn’t been maintained in so long that it is an eyesore and a hazard.” Detroit has several areas that are blight-ridden, where literally one street looks like any other (low-demographic) bit of suburbia, and the very next street over is 70% overgrown tangles of empty lot and 30% decrepit, leaking houses (some of which have squatters living in them). Blight is typically considered a deal breaker for property investors – in fact, many experts say that if your property has line of sight to a blighted property, you should never invest there. We disagree…a little. The thing about blighted neighborhoods is that they’re ultimately just like any other neighborhood whose value can go up or down as circumstances change, except that their value can’t really go much further down. It can be quite difficult to find a property that isn’t horribly overpriced in a blighted area, because almost every property that goes up for sale will have massive back taxes, overwhelming repair bills, or other hidden costs that make it way more expensive than it looks at first glance. If you can ferret out the hidden costs – establish clear title, get a very thorough inspection that includes approximate repair costs, check out the tax situation, uncover all of the liens, and otherwise get acquainted with the actual total cost of the house – and it’s still a good deal, you’ve got potential. Then it’s up to the city and the neighborhood. For nearly a decade, Detroit has operated with such poor enforcement of their own landlord licensing requirements that they’ve essentially had no such requirements. That’s been great for the people who own run-down miserable hovels (and the people who want to rent them). But now they’re starting to enforce those standards again, which means that if you buy a house in a blighted neighborhood, the chances are that your repair costs to get it up to code are going to be significant. You could just operate a hovel and market by word-of-mouth, but if the city catches you, they’ll fine you out of existence. It’s far better to make sure you’re prepared for the repair costs and have a realistic idea of the actual cap rate and/or cash flow (depending on your goals) that your property is likely to produce so you can make an accurate judgment on whether the returns will be worth the investment. The last thing you need, once you’ve gotten a grip on the Total Cost to Rent-Readiness, is to have a good idea that the blighted area you’re buying in actually is on the way up. Because while a blighted neighborhood might not go any lower, it totally can just sit there in a pool of its own misery for years on end. So seeking out an area that shows signs of reinvestment – or, if you’re willing to shoulder even more risk, an area adjacent to an area that shows signs of investment – is the last big key. Blighted areas are genuinely a trap, but they’re only a trap for the unwary. If you go in with the patience to sort through several dozen crappy properties and find the one or two that are genuinely amazingly cheap houses that you can get rent-ready for the cost of a high-end swingset (and then screen the tenants sufficiently well), you can come up with a house that makes a modest cashflow – but with a massive RoI.